We love collaborating with other brewers, learning from one another and swapping notes to make ourselves collectively better. Lately, we’ve been talking about European styles and how they’ve influenced us here in America – and we discovered that a few of our friends are resident experts! So we asked them to join us for a Beer Talk Series: three informal talks with local brewers discussing beers from around the world. These half hour talks will all be held here at Throwback Brewery, and will feature our own brew staff plus a different featured guest brewer each time. ing in Portsmouth will take us through a brief history of brewing in America, touching on the evolution of styles (think lagers, pale ales, and IPAs), brewing techniques, and use of ingredients – from pre-war USA to post-WWII to today’s ‘New American’ trend of aging in spirit barrels (with the spirits still in them!). A Q&A will follow the talk. 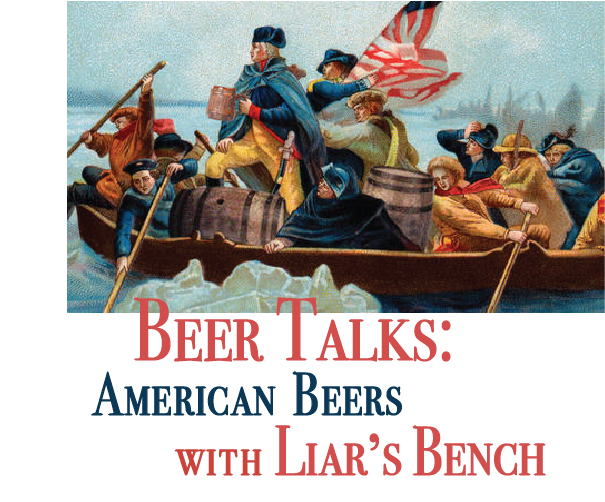 To toast this event properly, we’ll release a collaboration beer with Liar’s Bench that day. True Grits Cream Ale is a contemporary twist on an American classic. Why a Cream Ale? For one thing, Brewer Chris has been dying to make a beer using grits. But history-wise, traditional American lagers were mainly malt based, following in the footsteps of their German and Czech ancestors. Americans made them their own by introducing adjuncts (corn, rice) into the mix and creating two truly new styles: Steam Beers (beers with lager yeast fermented at ale temperatures – such as our Nor’East Common) and Cream Ales (ale yeast fermented at lager temperatures – like True Grits). We think you’ll find that True Grits is still crisp in the traditional style, but with a fuller body and a more hazy appearance than typical clear and delicate cream ales. Like traditional cream ales, this straw-colored beauty is very refreshing and easy-drinking, clocking in at 5.2% ABV. Tickets are $5 for this event and include an 8oz pour of our collaboration beer True Grits plus a snack pairing. Grab yours here! Look for the next two talks in the series, coming up on April 17th with Jay Bullen of Silvaticus who will talk about Belgian beers and a date in May with Tod Mott and Ian Goering of Tributary Brewing who will discuss German styles. Cheers!